Snap Deal, one of the hot deal sites in India, recently introduced a Splash Screen to grab email ids of visitors. This was perhaps thought to be an innovative idea to gather data and engage visitors. But it actually turns out to be frustrating users on the site. When you hit the CONTINUE button, it says: Please enter a valid email address. This is frustrating for users who want to continue browsing information on the site. If they can’t find the close button, they will most likely exit from the site (Snap Deal, I hope you’re listening). On some browsers, even the small, indistinct close button is not visible, leading to further frustration. I hope someone at Snap Deal will check their analytics and see the page exits; and quickly correct this - to offer users a choice to browse the site without submitting their email ids (see pic 2). Let users do what they want to and if they find the site useful, they will come back. And do business with you. Remember, it costs a lot of money and effort to bring frustrated users back to the site. First Impressions are very important not just for people, but brands too. Update: Life sometimes throws great surprises at you. Within minutes of reading this post, Kunal Bahl and Rohit Bansal, who lead the Snap Deal team, responded "We appreciate your spending time on Snapdeal and encouraging us to keep improving. It is definitely something that we noticed too. and realized that it isn’t the best experience from a user standpoint. The design of this page is changing soon. We are always open to getting better at what we do." I must say I was surprised at the openness and speed of response. 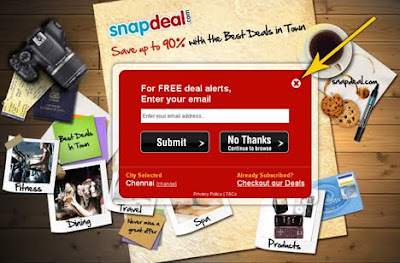 That is what you expect from nimble e-commerce sites that are customer friendly. Good Luck, Snap Deal, the hottest deal site in India. Note: Only parts of the response have been shared with readers. A shining new UI is what we can expect soon, they said. You may reach the author at rajasekar (DOT) india (AT) yahoo (DOT) com. You can't blame them, as a "Groupon Clone" they are sincerely doing their duties right :-). In Groupon.com you need to first select a city and enter Email address. May be this design worked well for Groupon, will it work for Snapdeal? only time will tell.